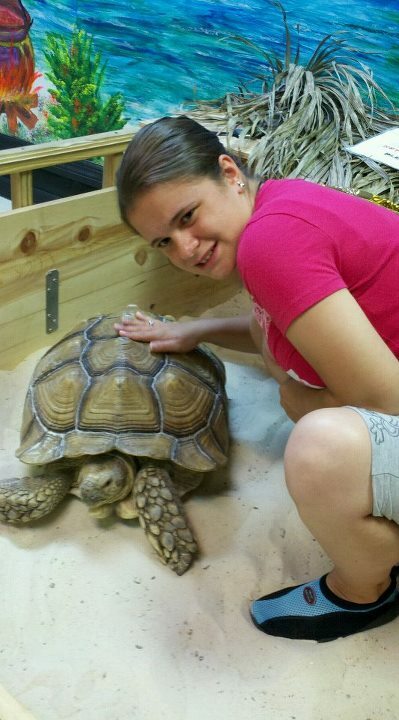 Hanging with a rescued tortoise named Rudolph at the Alligator Attraction at John’s Pass in Redington Beach, FL on July 11th, 2012. Hey there everyone, this is Jenna posting. Sorry I have not been able to blog in nearly a month for I have been on a two-week vacation in Florida for Fourth of July celebrations and this has prevented me from blogging about what had been going on down there. However, I wanted to blog today because I just wanted to give everyone a quick update on internship news I got the other day and nothing else. So, I am happy to report that this fall I will be doing an animal care internship at Theater of the Sea in Islamorada, FL. This internship involves working along side the animal training and care staff at the small park to feed and care for dolphins, sea lions, sting rays, sea turtles and other marine animals. The internship will also require interns to assist in food preperations, exhibit upclean and animal feeds through observation, discussion, and participation. For me, this internship will last from November 20th through Janurary 18th and this will mean my fanily and I will all be spending the Holiday season in the Florida Keys but it will be a great Christmas too. Orginally, I had plans to do an internship at Sea Life Park in Hawaii after getting offered a six-month internship that would last from August through January there but, not being able to find affordable housing on the big island had made it impossible for me to accept it. So, I had to turn it down but the internship coordinator there still wished me the best of luck though. So anyway, this just a quick update and I want to thank you all for continuing to support me and this blog and I will keep you posted.